Six Senses Zighy Bay has been on my bucket list for awhile, after I read about and dreamed many dreams about staying there! Where oh where can and how will I begin to tell you everything and anything about Zighy Bay without sounding too high and mighty or puffed up in a few words! This is by far the most beautiful hotel I have ever been to in my whole entire life. Coming from moi, means a lot, priding myself as a well seasoned/travelled person. Let me share with you my mini weekend getaway. You are bound to want to go there after checking out the pictures and reading my review! It all started Saturday morning, when I woke up at 6am, filled to the brim with excitement and anxiousness (remember those road trips with family when you were little) to get up, pack and get the show on the road! I kept shouting, I mean telling my husband “Hurry up, get ready, pack, we are going to be late!!!”. I did not want to miss out on one single minute at Zighy Bay! When we finally loaded up the car, set up the navigation system, we were on the road by 10am. The drive from our home was only 1h30 minutes (not bad at all). When we got to the “Six Senses Zighy Bay” sign I had no idea what was beyond that point. We drove up a winding, steep, incredibly daring road, feeling a little scared, stomach in my throat feeling and extremely anxious. Finally, we reached the lookout point (about halfway up the hill) we were all gob smacked by the stunning view of the resort and beach skyline. A few minutes later we drove up to the check-in area where a team of staff dressed in fresh white linen greeted us, opened the car doors, and took our suitcases and stroller without us even asking! I shared a few words with the staff as we were handed cold towels, followed by our welcome drinks. The very best smoothie that has touched these lips, oh my! A “died and gone to paradise” smoothie! It was a date smoothie (the dates were harvested on the resort). At this point my eyes welled up with tears as I couldn’t believe I was finally vacationing at Zighy Bay! We were then whisked away by our friendly butler Rashid. Yes, you heard that right, our very own butler! Our villa was something out of a celeb gossip mag! Perfect getaway for Kim & Kanye! Our own bicycles parked out front of our two story high villa, a big soaking tub, two showers, a lounging area, a gorgeous patio upstairs with a view of our very own private infinity pool with doors leading out to the beach! Phew! I could barely hold my breath while typing that! Can I just say, whoever designed the interior of these villas needs to call me pronto and help me transform my home to look the same! So eco conscious. Every single piece used in the villa came from nature, no plastic or artificial things anywhere insight! 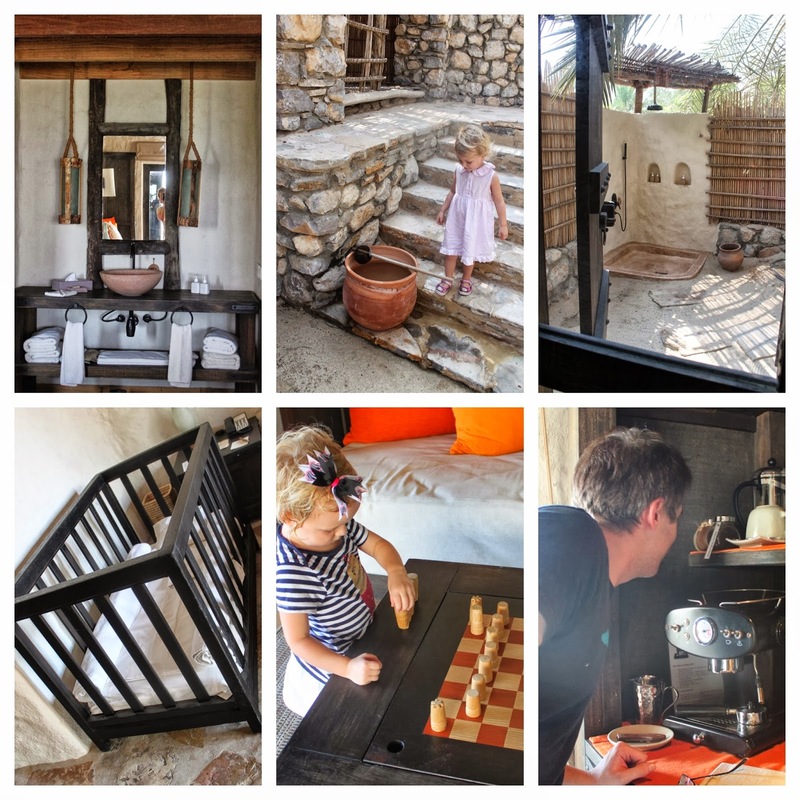 The roof is thatched with wooden sticks, the cool floors with beautiful stone (a wonderful feeling on my tired feet), the beds lined in thick organic smooth sheets. The lamps, sink and bath carved of wood and stone, the furniture of hardy solid wood, and the staircases made of re purposed wood tied with cord. I could go on, and on about the details of the room but it is truly something you need to see in person to appreciate its beauty! Jaw dropping! Zighy Bay Six Senses is the most amazing resort I have set my eyes on for more reasons than its beauty. 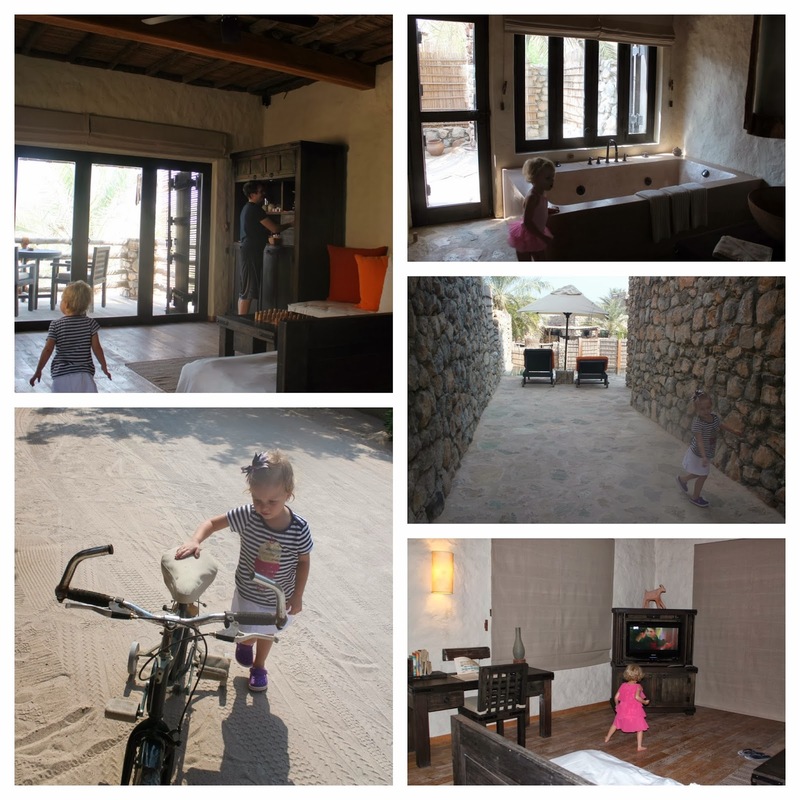 Being an eco-conscience Mommy, I really admire all of the efforts the resort has taken. It cares for our planet and does the very best it can to preserve it. My favorite thing was that they place glass bottles in the room which get refilled on site as not to pollute the planet with more plastic! Even when we ate at the restaurants, they had cloth napkins. There wasn’t even a plastic pen in the room, rather a carved wooden stick turned to into a pencil! 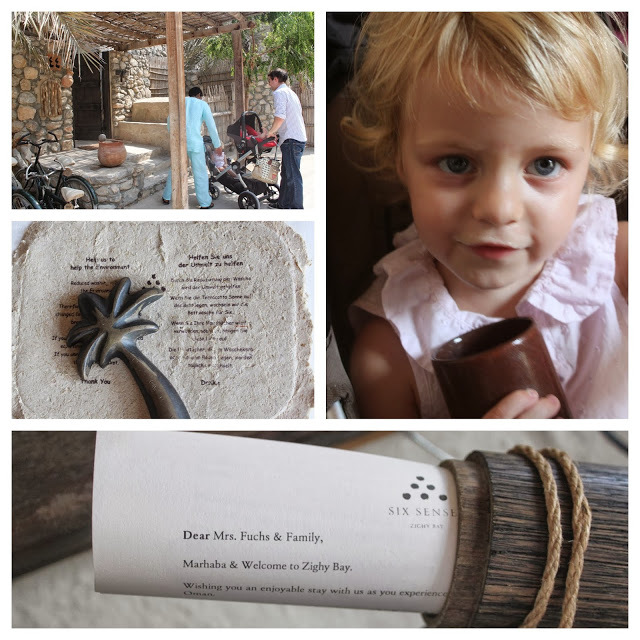 The plates and cups were made of the most luxurious, comforting clay, all handmade. Every few days they have beach cleanups. The beach at Zighy is one of the top beaches I have been to in the world. The sand was like butter cream, silky soft, and the water crystal clear, not a fragment of plastic or garbage to find! 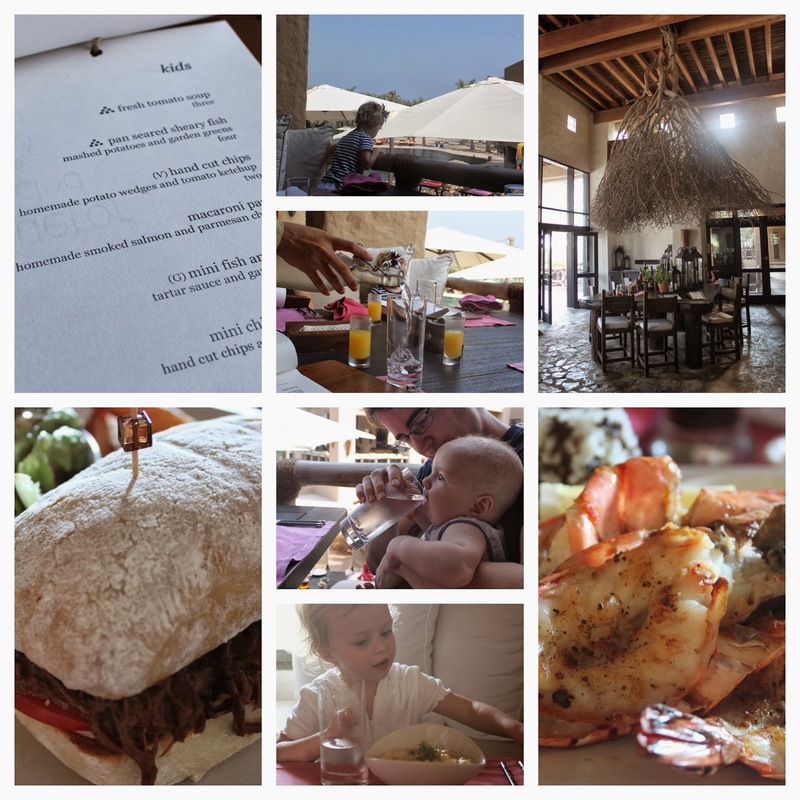 When we stopped drooling and finally finished checking out the villa, we jetted for food! The food was delicious and filing. We dined at “Summer House” for both lunch and dinner. We first stretched out outside on one of the fluffy cushions overlooking the breathtaking pool. Chris our server handed us cold towels which we all very much needed as we were scorching hot! We were also given complimentary refreshment drinks. Both hit the spot but we were just sweating bullets and shifted to a table indoors. 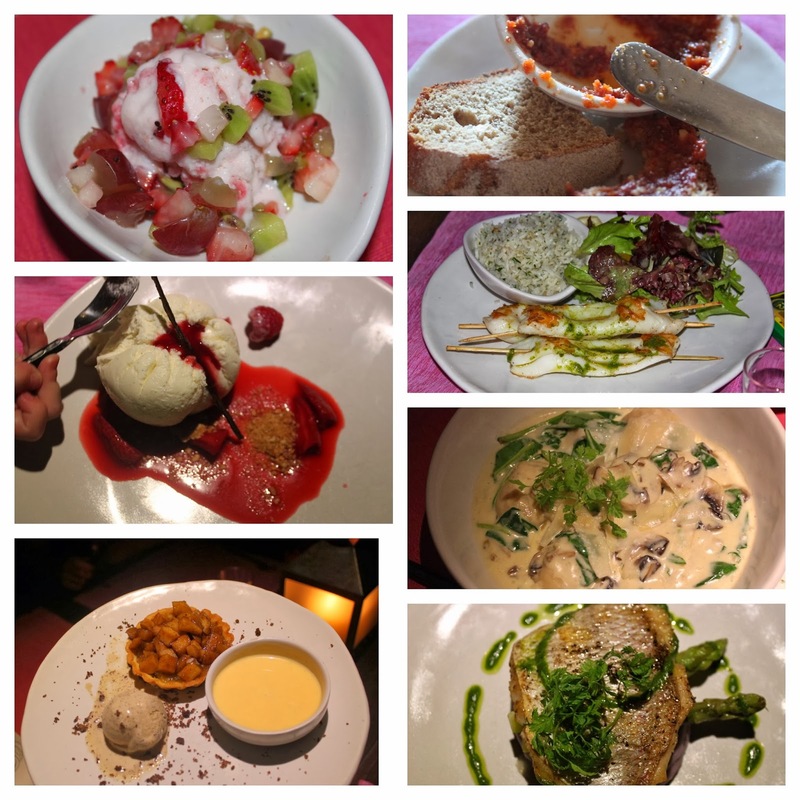 Our server had to come back more than two times as we were reviewing the menu over and over, undecided what to pick as everything sounded amazing. During this time a selection of bread and spread were brought to our table. So so yummy I soaked up the last drop with bread! My husband finally settled on king prawns (the best I have ever tasted). I had a cold gazpacho soup to further cool down. Then I had a pulled beef sandwich which was better than the one I once had in Texas from a tiny roadside stand. I have been salivating for it for over two years now! My husband wanted to order it a second time that evening it was THAT tasty! Ruby had the yummiest macaroni with bits of fresh salmon. I only wish I knew how to make it myself! Speaking of which…I would love to take a cooking class that they offer at the resort! After lunch we ran back to the villa, threw on our swimming gear and literally jumped like humpback whales into our private pool. Ahhhhh! So refreshing and relaxing! Ruby had a blast swimming around and playing in the sand in our “backyard”. She chilled out with daddy in the lounging areas (we had two). While I stretched every limb in my body in the pool, I repeated out loud over and over and over “ I never want to go home”. I wanted permanent residency at Zighy Bay! I still do! After swimming, we quickly got ready and went to the reception area for our Sunset Cruise. Our driver took us to the pier by car where we were ushered to a beautiful boat. The cruise was just what I needed. Both the kids were so relaxed they crashed out. We hung out on lounge chairs, and spread out on pillows near the front of the boat snacking on canapés and sparkling date juice. What a life! We enjoyed the scenery and mountain scape, but before we knew it the boat was heading back to the pier. It lasted for 1hr30mins, totally worth it! After our cruise, we went back to our room, changed, while Ruby had a bit of a dance off in front of the TV in our living room! We were ready for round two of eating! For dinner I had the catch of the day over purple mashed potatoes and sprigs of asparagus, drizzled with pesto. To die for! My husband ordered the calamari on skewers with a salad and jasmine rice. Ruby had the fish and chips which were also very tasty and fresh. To entertain Ruby while she started to get a bit cranky (bedtime) Chris brought over some pencil crayons for her as she scribbled away in her Strawberry Shortcake coloring book. We decided to spoil ourselves with dessert! Patrick had the apple taster, a selection of apple desserts, I had the vanilla bean cheesecake with date ice-cream. Ruby wanted pink ice cream and fruit, so they made her a strawberry scoop with bits of kiwi and pomegranate, her bowl barely had a drop left! After dinner I was so zonked out with all the fresh air from our boat cruise, and stuffed with food, I passed out in the ubber comfy bed snuggled with my little man, Ruby, and Patrick! The kids slept like angels. Nate especially, the best in MONTHS! I am telling you, it’s a sign…I need to move to Zighy! I almost had to wake the children up as not to waste our morning before checkout at noon. By 8am we were finally dressed and ready for breakfast. We had the buffet at Spice Market. One of the most beautiful organic spreads I have seen. A huge selection of fruits, one area with muesli and cute berry yogurts in mini glass jars, fresh juices and smoothies which I am already dying to have again all served in my favorite pottery glasses and pitchers. Another section with homemade jams, homemade breads and pastries, cold cuts and much more! PLUS you could order custom hot meals; I had the waffles, and my husband scrambled eggs with toast. The coffee was fantastic; my cappuccino went down so smoothly! After I had my coffee and energizing breaky I was rushing everyone to hurry up so we could go swim!! How annoying am I haha! We had all our bathing suits underneath our clothing so Patrick and Ruby jumped into the main pool, we then walked over to the beach, swam in the ocean, then checked out the second pool which was totally awesome, because it was filled with salt water and resembled the ocean. We then went back to our private villa and spent the last 2 hours splashing, laughing and having a wonderful time. At 11:15am we all looked at each other with great dismay and said it was time to wash up, pack and get ready for checkout time. Ruby had a fit, and started crying about her house, and how much she liked it, we were almost late, but Rashid came to the rescue with his buggy and drove us to the reception where we sorted out bills and handed back our room key to Momen who was just the friendliest gentleman. I asked Rashid if he could quickly show me the organic garden which I had walked by a few times near to our villa. He was happy to show it to me, and I learnt that Six Senses grows many of their cooking herbs in that garden, they also have cooking classes and chef meetings. It was really pretty. He drove us back, where our car was ready from valet. By the time I was back, our bags were packed in the car, Patrick picked up Ruby, strapped her into her car seat and I was busy putting Nate in his. Reality set in…it was time to go home. What a beautiful stay we had. 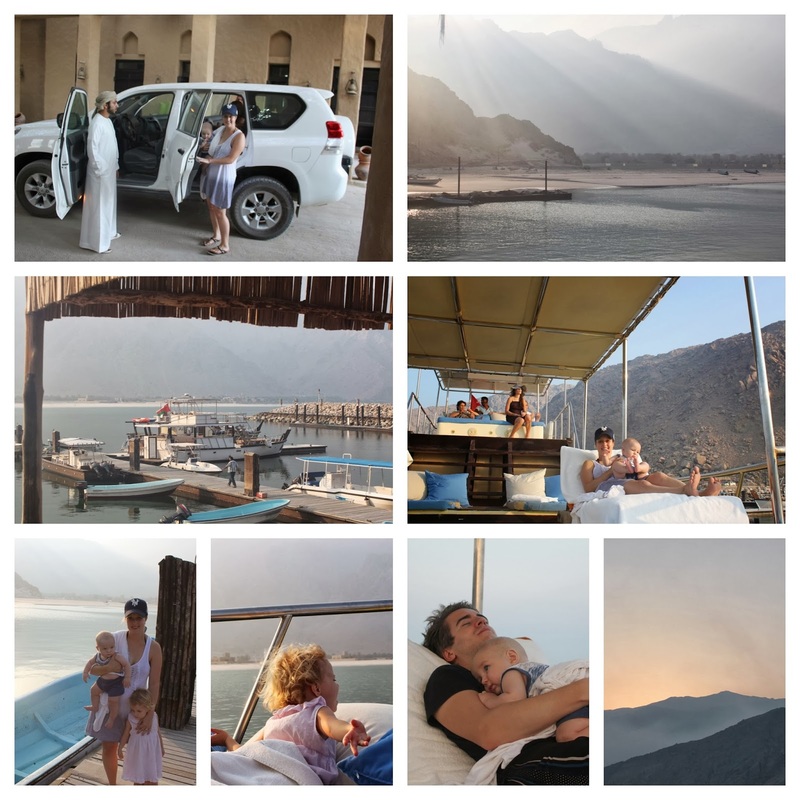 I felt rejuvenated, filled with tons of fond memories of my little family, well fed, soaked with vitamin D and ready to head back to the hectic city life. Just what the doctor ordered. If there is one thing you should do in your lifetime, is go to Zighy Bay and have your senses revitalized. Single, married, or with kids it is a must! 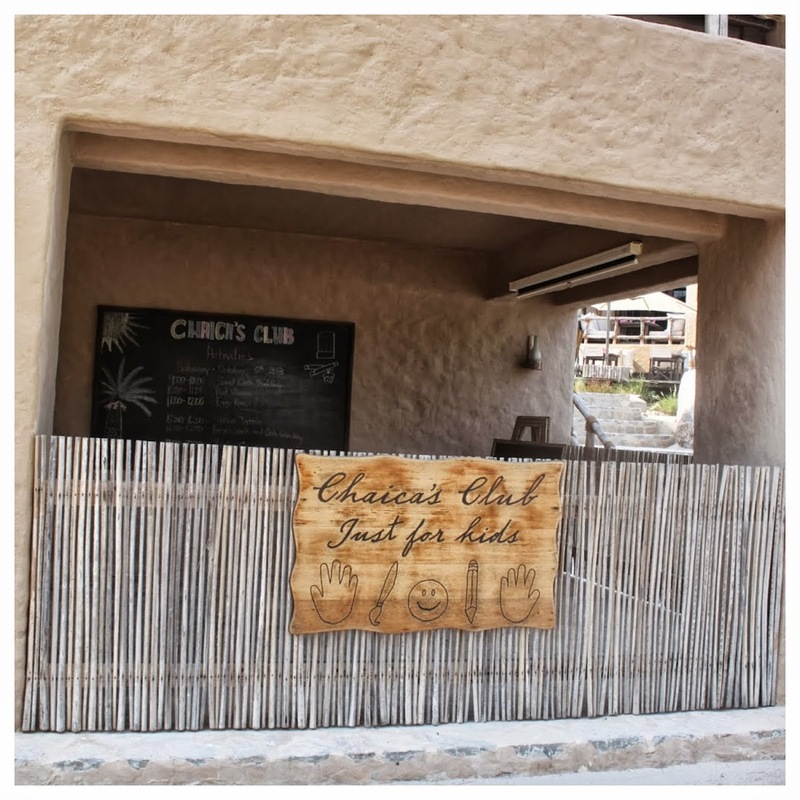 If Ruby was a tiny bit older she could have even played at the children’s centre “Chaica’s Club Just for Kids” with daily activities, such as kite flying, sand castle making and more! I would have also have loved to partake in “movies under the sky” but we were just too tired the first night!